A framed paper honour roll with five columns lists the names of those from the district who served in the World War One. Copies of the roll were presented to schools in the Road Board District. At the top of the roll are the two crossed flags of Britain and Australia. There was a large attandance at the Greenmount State School last Saturday evening on the occasion of the presentation of an honor roll of the district to the school by Mr. A. W. Brown, J.P., on behalf of the Road Board. 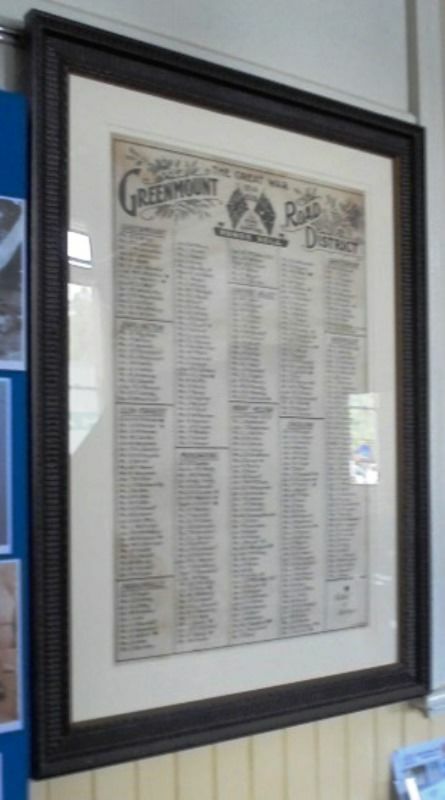 The site of the War Memorial is at Mundaring; but as the Greenmount district is a large one it had been decided to present copies of the honor roll to each of the five schools in the Road Board District. The roll contained the names of volunteers for the Great War from Greenmount, Darlington, Glen Forrest, Parkerville, Mundaring, Sawyers' Valley, Mount Helena, Chidlow, Sanatorium, and Wooroloo. It was neatly written and inscribed, bearing at the top two Union Jacks, and was nicely framed. Swan Express (Midland Junction, WA), 4 September 1925.